The first four of seven bracelets have been won this week at the 2012 World Series of Poker Europe being contested at the Casino Barrière de Cannes Croisette in Cannes, France. Winners thus far include the first ever Tunisian WSOP bracelet winner, Imed Ben Mahmoud, another 2012 bracelet for Antonio Esfandiari, and the first two French WSOPE winners in Roger Hairabedian and Giovanni Rosadoni. Overall turnouts are somewhat down from last year's WSOP Europe in Cannes, with the number of entrants having decreased in all events thus far. However, the excitement surrounding the awarding of new bracelets remains high. Here's are recaps of how those first four events played out: Event No. 1: €2,700 No-Limit Hold'em (6-max.) The first event saw Imed Ben Mahmoud, currently a resident of Antibes, France (near Cannes), become the first ever native of Tunisia to win a WSOP bracelet of any kind. Mahmoud's full-time occupation is a kitchen worker, and is a recreational player who has only been playing poker for three years. A total of 227 entered the event (down from 360 last year), with the top 24 finishers making the money. Cashers included Phil Hellmuth (24th, €4,887), Paul Guichard (23rd, €4,887), Brandon Cantu (20th, €4,887), Jennifer Tilly (17th, €6,548), David "ODB" Baker (14th, €6,548), and Ruben Velasco (€12,040). After two days of play just eight players remained, at which point Mahmoud was one of the short stacks in sixth while Yannick Bonnet of France held the chip lead. However, by the time those two made it to heads-up play the pair were nearly even in chips, and it wasn't long after that Mahmoud grabbed the advantage, then won following a preflop all-in in which his Js-Jc held up versus Bonnet's Kc-Kd. Event No. 1 (€2,700 NLHE 6-max.) final table payouts: 1. Imed Ben Mahmoud -- €147,099 2. Yannick Bonnet -- €90,884 3. Matan Krakow -- €63,371 4. Senh Ung -- €44,913 5. Roberto Romanello -- €31,925 6. Sylvain Ribes -- €22,876 Event No. 2: €1,100 No-Limit Hold'em A total of 626 entered the second event (771 played last year), with the "Magician" and "Big One for One Drop" winner Antonio Esfandiari emerging to win his second bracelet of 2012 and third overall. The win catapulted Esfandiari to the top of the WSOP Player of the Year leaderboard, although the battle for that honor will continue through the end of the WSOPE as most of those still in the race are in Cannes vying for bracelets. The POY race will continue into October, as well, as WSOP Main Event final tablist Greg Merson can still pass everyone with a high enough finish there. Among the 63 making the money in Event No. 2 were Marvin Rettenmaier (47th, €2,133), Tristan Wade (43rd, €2,344), Event No. 3 winner Roger Hairabedian (39th, €2,344), Dominik Nitsche (34th, €2,608), Erik Cajelais (27th, €3,846), John Monnette (23rd, €4,489), and Casey Kastle (15th, €7,680). Esfandiari began the nine-handed final table with the chip lead, and he had the lead as well to begin heads-up play against the Frenchman Remi Bollengier. Esfandiari immediately began to widen the gap, then a hand arose in which the pair bet all three post-flop streets as the board came 10c-8s-As-Qd-5d, finally getting all of Bollengier's chips in on the river. Bollengier held Qs-7s for queens, but Esfandiari had Qc-8d for two pair to give him the win. Event No. 2 (€1,100 NLHE) final table payouts: 1. 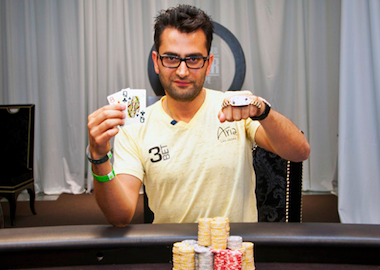 Antonio Esfandiari -- €126,207 2. Remi Bollengier -- €78,059 3. Salvatore Bonavena -- €57,079 4. Antonin Teisseire -- €42,356 5. Valentin Detoc -- €31,869 6. McLean Karr -- €24,309 7. Ashly Butler -- €18,798 8. Jamel Haddad -- €14,736 9. Florian Ciuro -- €11,707 Event No. 3: €5,300 Pot-Limit Omaha After coming one spot shy of winning the first two events at the 2012 WSOPE, a Frenchman finally broke through and took the first ever WSOPE bracelet for France in Event No. 3 with Roger Hairabedian's victory in the €5,300 PLO event. "Big Roger" topped a field of 97 for the win (again, down from the 180 who participated in this one last year). Just 12 players cashed in this one, with Vanessa Selbst (12th), Douglas Corning (11th), and Bruno Fitoussi (10th) missing the final table but making the money, all earning €9,929 for their finishes. The final table included some familiar faces, including Jason Mercier (who finished 9th), Joe Hachem (who took sixth), and Michael "The Grinder" Mizrachi (ousted in third). Ultimately it was Hairabedian and Ville Mattila of Finland who made it to heads-up play, with Hairabedian enjoying a better than 2-to-1 chip lead to begin their duel. They would end up battling for nearly three hours, although Hairabedian continued to maintain the lead throughout before finally finishing off Mattila to win. Event No. 3 (€5,300 PLO) final table payouts: 1. Roger Hairabedian -- €142,590 2. Ville Mattila -- €88,130 3. Michael Mizrachi -- €62,749 4. Jussi Ryynanen -- €45,581 5. Jussi Nevanlinna -- €33,765 6. Joe Hachem -- €25,490 7. Michel Abecassis -- €19,606 8. Michael Schwartz -- €15,357 9. Jason Mercier -- €12,245 Event No. 4: €3,250 No-Limit Hold'em Shootout The fourth WSOPE event of 2012 saw another Frenchman, Giovanni Rosadoni, win the bracelet while playing in his first-ever WSOP event. A total of 141 entered this one (down significantly from last year's 258). Day 1 saw them play at 20 tables, with the winners of those tables all coming back for Day 2 to play the rest of the event starting from two tables in a multi-table tournament format. A number of big names made it to the second day (and the cash) in this one, including several bracelet winners. Among those falling shy of the final table and winning €5,428 were Matt Stout (18th), Faraz Jaka (17th), Daniel Negreanu (16th), Dominik Nitsche (15th), Chance Kornuth (14th), Phil Hellmuth (13th), and Philippe Boucher (11th). Rosadoni still had a lot to contend with at the final ten-handed table, though, including two multiple WSOP bracelet holders in Oleksii Kovalchuk (who finished 4th) and John Monnette (who finished 3rd). Ultimately Rosadani and Dan O'Brien made it to heads-up late on Day 2, and when the casino had to close at 5 a.m. they returned on Thursday to finish their match with Rosadoni ultimately prevailing. Event No. 4 (€3,250 NLHE Shootout) final table payouts: 1. Giovanni Rosadoni -- €107,614 2. Dan O'Brien -- €66,503 3. John Monnette -- €48,177 4. Oleksii Kovalchuk -- €35,560 5. Adrien Allain -- €26,724 6. Paul Guichard -- €20,434 7. Roman Romanovskyi -- €15,890 8. Trond Aanensen -- €12,564 9. John Duthie -- €10,095 10. Valentin Messina -- €8,239 Three events remain to be decided in Cannes -- the €10,450 NLHE "Split Format" (or "Mix-Max") event (No. 5), the €1,650 PLO 6-max. event (No. 6), and the €10,450 NLHE Main Event (No. 7). Event No. 5 has reached the heads-up portion of play with 16 players left from a starting field of 96, including massive chip leader Brandon Cantu, Faraz Jaka, Roger Hairabedian, Jon Aguiar, Marvin Rettenmaier, Jennifer Tilly, Phil Hellmuth, Mike Watson, Bertrand "ElkY" Grospellier, and Jason Mercier. Meanwhile, the first day of play in Event No. 6 has concluded with just 26 players left from the 206 who entered. Jacob Dahl currently leads there with David Benyamine, Andrew Lichtenberger, Ana Marquez, and Dan Smith among those in the top ten. Join Betfair Poker Now. Prior to 2012, no French player had ever won a bracelet at WSOP Europe. Event Nos. 1 and 2 saw Frenchmen come one spot shy of becoming the first with Yannick Bonnet and Remi Bollengier both finishing runner-up. However the next two events finally saw France earn their bracelets, with Roger Hairabedian (of Grasse) and Giovanni Rosadoni (of Nice) earning gold. Seven of the Best Gambling Songs!